Historical records suggest that sheep have been known on Arapawa Island, NZ, in the Marlborough Sounds for at least 130 years. Most likely the Arapawa feral sheep are escapees of a flock of Merino Sheep. To those unused to their distinctive appearance, Arapawa sheep may at first acquaintance seem ungainly or even ugly, with their somewhat hunched appearance and often ragged fleece. Certainly they bear little resemblance to their more immediate Merino ancestors and even less to the Merinos familiar to us all today. Arapawas are not large sheep, being rather lean and light-boned. The clear narrow face and head, with alert bright eyes, is set on a long neck and topped with slender ears. 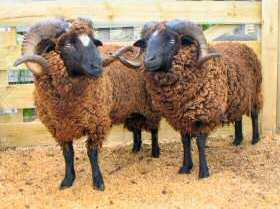 Rams may have spiraled horns which can be over a meter in length. Their light build, together with their rather long legs, makes them a very active sheep as befits animals which had to survive for more than a century in very steep and hostile terrain – not infrequently invaded by equally hostile human hunters. In repose Arapawas carry their heads rather low, and it is this tendency coupled with low-set long tails, which gives them a hunched look. Their most common coloring is all black – with a depth of blackness which is particularly striking in the lambs – but Arapawas may often have white points, and on very rare occasions be pure white. The most strikingly colored are those which are spotted with white over the whole body, and which are often referred to as 'cocktail' Arapawas. The fleece of the Arapawa is of Merino-like fineness and is of particularly high bulk which makes it of interest to textile manufacturers; it also makes excellent waterproof felts for head and footwear. It has, as well, great insulating properties – important for a sheep in the wild. However, individual fleece weights are considerably less than those found in commercial wool breeds, although the natural tendency for the fleece to be shed, which occurs in most wild sheep, is not so marked under farm conditions. Feral sheep are also naturally more resistant to fly-strike, and at AgResearch Lincoln in Canterbury, NZ, research is currently underway to introduce this characteristic of the Arapawa into a new "no-fuss" sheep breed. Arapawa meat is fine-grained, sweet, lean, and with a special 'gamey' flavor much sought by restaurateurs. The New Zealand Arapawa Goat Association is made up of a group of people from around the world who are passionate about the survival and welfare of this beautiful, critically at-risk breed of small goat.